It all started about 10 years ago, while I was working at a hole-in-the-wall auto parts store. I always had a good relationship with the customers who came in – especially the regulars. One day, one of our regulars came in and was talking about this little red convertible he had down at his shop. 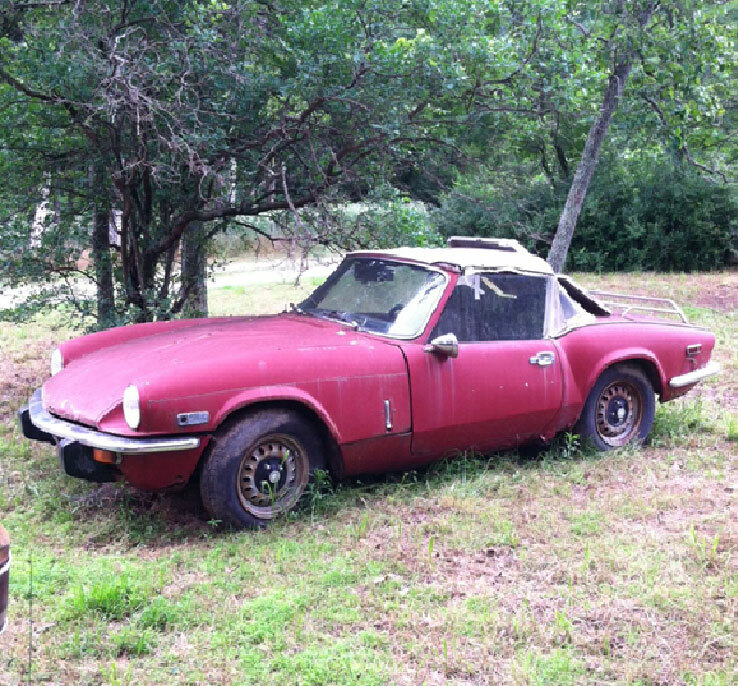 It was not uncommon for him to be discussing a new junker he had bought and drug in, but it was uncommon to hear of a Triumph Spitfire, something I had never even heard of, in this small Ozark Mountain town. I could hardly wait until I had a chance to make a delivery to his shop. When I pulled into his driveway, it was love at first sight! There she sat; top down, and ready to go. I could hardly wait to run my fingers over the steering wheel. Looking back, I can now see that it was really just a rough old car, but at the time, I had big dreams. I bought the car for just a few hundred bucks and set in working her over to make her road worthy. I ordered a parts book from Victoria British, and went mad ordering parts. I planned to rebuild the engine and just fix everything. In the mean time, I decided that since the little car would run, I would driver her a bit. So, one day, I headed out for work. What I had was one of a kind in my little world. What an exhilarating experience! Even though I had ordered a new convertible top, it hadn’t come in yet, so I brought a piece of black plastic sheeting and some Duck tape along just in case. I was so excited just driving that little thing around town. Being 6’4”, I sure it was an amusing sight, seeing me cruising down Main St. I could literally drag my fingers on the pavement as I drove around on my lunch hour. I was having a great time! As it grew later in the afternoon, the sky started to darken, and along with it, so did my spirits. I stepped outside and created a makeshift convertible top with the black plastic sheeting and Duck Tape. Before quitting time, the rain hit. It was then that I remembered that the wipers didn’t work, and my spirits sunk a little lower. As I started out for home I knew it was going to be a long 13 miles to my house. After about a mile, I realized that something had to be done, because I couldn’t see to drive at all. I pulled under the awning of the nearest gas station, bought a can of Coca-Cola, and dumped it over the entire windshield to allow the acid to clean it. I then applied RainEx in hopes of being able to see to drive. Feeling a bit more hopeful, I started out for home again still struggling to see, but with at least some increased visibility. After another two or three miles, the rain began to come down harder and harder and I noticed that the Duck Tape at the tip of the windshield was starting to come loose. There was only one thing to do, but steer with my knees and hold the makeshift top in place with both hands, turning loose only long enough to downshift to climb the hills. The road was covered with running water, and there were few times I just knew I was headed for the ditch. It was such a relief to finally pull my treasure into the driveway. It had not been the best driving experience I had ever had, but it sure was one that I would never forget!